What Must You Know When Ordering Custom Neodymium Magnets? 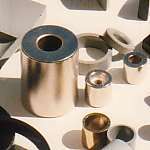 Armstrong Magnetics sets up a huge stock of magnet materials in Bellingham WA, including Neodymium magnets, Samarium Cobalt magnets and Ceramic magnet in a wide variety of shapes, dimensions and grades. These stocked magnets can be shipped out to customers in 1-3 days after receipt of purchase orders. Besides the stocked products, we often accept customer orders for custom Neodymium magnets. However, ordering custom Neodymium magnets is quite different from ordering the stocked ones. To produce any custom Neodymium magnets (or Samarium Cobalt magnets), we need detailed information on the Neodymium magnets: dimensions, grade, coating, magnetic orientation, quantity and sometimes the drawings of the magnets with more complex shapes. Normally we can finish custom Neodymium magnets (or Samarium Cobalt magnets) and ship them in 6 weeks and deliver them to customer’s door in 7 weeks. During busy production periods, the lead time would be longer. We manufacture custom Neodymium magnets to meet or exceed all requirements in the customer orders and provide Test Reports, B-H Curve Plots and Certificate of Conformance (C/C). We guarantee the quality of the custom Neodymium magnets themselves, but not the success of any system integrating the custom Neodymium magnets. Any orders for custom Neodymium magnets would not be allowed to be modified or cancelled after issued, because the custom magnets would not be suitable for any other customers' designs. Customers must carefully consider all aspects of the product before placing orders. We begin the production of the custom Neodymium magnets after receipt of the order and the payment. For the customers who have accounts with us, we begin the production after receipt of the orders and don’t need the payments prepaid in advance. Copyright © 1994-2016 Armstrong Magnetics, Inc. All Rights Reserved.